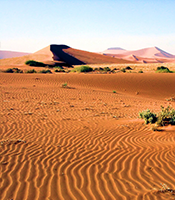 Come and visit Namib Naukluft National Park. 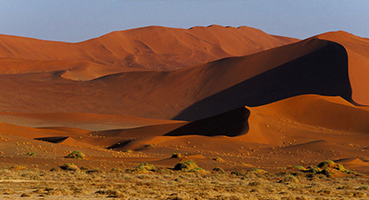 This is one of the largest National Parks in Africa (40 000 sq. km) and fourth largest in the world. 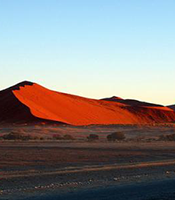 There are four sections in the park: Sossusvlei and Sesriem, Naukluft, Namib section and Sandwich Harbour. The Naukluft Mountain Zebra Park was established in 1964 with the accrual of farm Naukluft as a sanctuary for Hartmann’s zebra. Most of the farm surrounding Naukluft mountain massif was purchased by 1970. 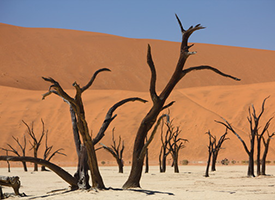 In 1979 the area known as Diamond Area 2 (south of Kuiseb River, including Sesriem and Sossusvlei) was added to form Namib Naukluft Park. The following mammals are likely to be seen: steenbok, springbok, Oryx, kudu, mountain zebra, dassie rat, chacma baboon, rock dassie, and klipspringer. Up to 200 bird species have been recorded in the area. Sesriem Canyon is located only 4 kilometres from Sesriem. The canyon, approximately 2 to 4 million years old, is up to 40 metres deep and about 3 kilometres long. 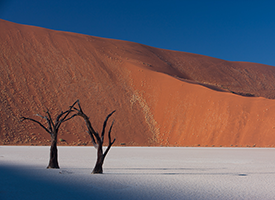 Sossusvlei – Huge red sand dunes, camel thorn trees and vlei (shallow water pond) itself, filled occasionally after a good rains are the attractions of the area. The name of Sesriem is derived from the fact that to reach water six ox thongs were used in old times. 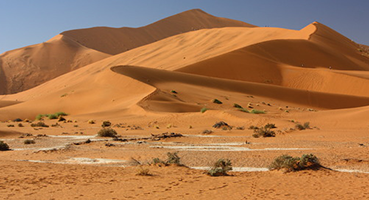 Whilst in the park we explore the desert by means of foot, from climbing the dunes for sunset to the option of a guided walk into Sossusvlei and Dead-Vlei to learn the history of the desert and find the local inhabitants that live in this arid terrain.